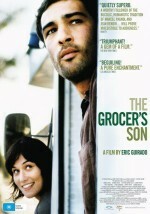 On paper, there's nothing remarkable about Eric Guirado's gently empathetic The Grocer's Son that might recommend it above any other slightly implausible tale of personal transformation in a humble setting. The vaguely misanthropic Antoine (Nicolas Cazalé) returns from the city to his family's provincial general store after his father (the delightfully craggy Daniel Duval) suffers a heart attack. Antoine reluctantly agrees to take over the grocery van route through the area's remote hamlets, dragging along his spunky neighbor, Claire (Clotilde Hesme), in the hopes that his not-so-secret crush might bear fruit in the country air. It sounds trite, so why does The Grocer's Son feel like such a fresh breeze, a holiday snapshot of the perils of family, love, human decency, and the inexorable shifts in the French culture and landscape? Guirado triumphantly wrestles against every lousy cinematic instinct and presents a subdued, finely structured work whose uncluttered and poignant realism emerges as its finest asset. The performances are commendable—particularly Cazalé, who fills out a role that tempts cheap distaste and a hasty redemption—but the film's success rests on its simplicity. Guirado's eye for the patterns of rural life and the novel strains they exert shine through with clarity.